Factory GT coupe with original build sheet, owners manual and highly documented history / receipt file. You could not build this car for near the asking price…! 1965 Ford Mustang GT Coupe – totally original and un-restored. Caspian Blue with blue and white Pony Deluxe interior. Running a 289 Windsor V8 and C4 automatic. Other factory options include: Power steering, Kelsey Hayes 4 piston Disc Brakes, Pony deluxe interior, centre console, woodgrain appointments, deluxe wheel covers and all of the usual GT appointments. It is a running driving car with original body panels, floors & frame. California built & owned so rust free. One for the restorer. 1968 Ford Mustang Coupe – super low production in this combination – Marti Report verified. Presidential Blue with blue luxury interior. Running a 289 Windsor V8 and C4 automatic. Other factory options include: Power Disc Brakes, power steering, air conditioning, Interior decor group, visibility group, upper & lower consoles, woodgrain appointments, tinted glass & deluxe seat belts. It is a running driving car with original body panels, floors & frame. California built & Nevada owned so rust free. Perfect for the restorer. 1966 Ford Mustang coupe in Sauterne Gold with pony deluxe interior. This is such a gorgeous colour combination and such a classic look. California built and owned from new this Mustang has been tastefully restored to it’s original colour combination. Perfect under body, floor and frame and as you would expect from a California owned car with zero rust. It runs a super smooth rebuilt 289 Windsor V8 coupled to a C4 automatic transmission. Options include power steering, style steel wheels with white wall tyres, deluxe pony interior and woodgrain appointments. 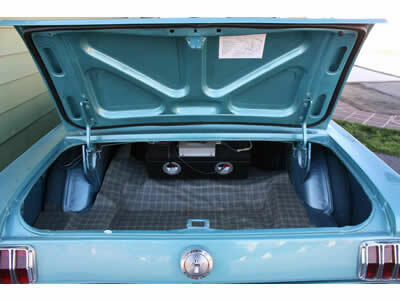 The interior is in excellent condition and both engine bay and trunk nicely detailed. The chrome and bright work is all in perfect condition as is the vinyl roof. It runs and drives perfectly and would suit someone looking for either an every day driver or weekend show car. Please call for more details or to arrange your test drive. Super rare, one of one built in this combination. California built, finished in its original colour of Royal Maroon with red deluxe interior, It sports a rebuilt 289 V8 Windsor engine and C4 automatic transmission. Other options include, Air conditioning, power steering, GT style hood with lamps, exterior decor group option, interior decor group, centre console, upper roof console, front seat headrests, upgraded audio system, tinted glass and GT style wheels with raised white letter tyres. It runs and drives super nice with plenty of power, brakes well, steers perfectly and is the perfect weekend cruiser. 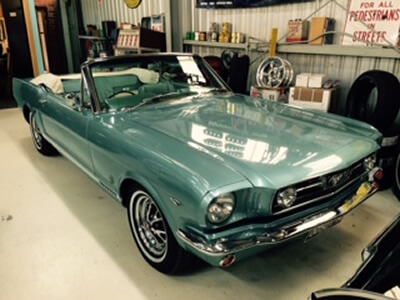 Classic Mustangs like this one don’t come around too often, so be quick to secure this beauty. This custom built Ranchero retains its old skool look but with a fully modernised driveline. Running a freshly built 289 Windsor V8 coupled to a C4 automatic with Lokar shifter and Ford 8 inch rear end. Other upgrades and options include front disc brakes, rack and pinion steering, dual exhaust system, American racing torq thrust II wheels, sport tyres, upgraded audio system, upgraded dash instrument cluster and tinted windows. The paintwork and chrome are both near perfect with little or no flaws to speak of. Interior is nicely done and super comfortable. This cool pickup runs and drives perfectly…. you could not build it close to the asking price…!! Here we have an awesome restomod 1965 Ford Mustang Coupe in Ivy Green. Running a Ford racing crate 302 and 5 speed Tremec transmission this Mustang has been built to drive…! San Jose, California built – original paint & trim combination correct to the door tag. Runs and drives amazing with plenty of get up and go! 1970 Ford Mustang M code Mach1 in super rare Grabber Orange. Here we have a true time capsule that has been well owned and loved by the previous owner in USA with just over 93,000 original miles. It runs a healthy 351 Cleveland engine with an Edelbrock intake & Holley carburettor all coupled to a 4 speed toploader with Hurst shifter and 9 inch rear end. Other options include power steering, power disc brakes and dual exhaust system. Factory options – Black hood stripe, Deluxe interior, woodgrain appointments, centre console, rim blow steering wheel, AM/FM radio, front spoiler, pop open gas cap, sports mirrors, front sport lamps, Mach1 hood scoop and Magnum 500 wheels with BF Goodrich radial TA tyres. 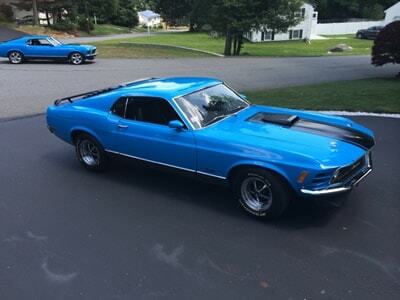 This Mach1 is an absolute standout that runs and drives unbelievably well. This is a true collector car that will appreciate greatly in years to come. Amazing buying at this price – be quick…! 1966 Ford Mustang GT Coupe in Raven Black. Here’s your chance to own a factory GT 4 speed manual Mustang coupe – super rare in this combination. It runs a 289 4V Windsor V8 with a Ford intake manifold and aftermarket Edelbrock carburettor coupled to a 4 speed toploader transmission and correct factory shifter. Other options and upgrades include air conditioning, Kelsey Hayes disc brakes, heavy duty sway bar & suspension, Export brace, pony deluxe interior, pony steering wheel, woodgrain appointments, CD player with kick panel speakers, 3 point seat belts (front only), style steel wheels with BF Goodrich radial TA tyres, trumpet style dual exhaust and GT fog lamps. All in all a really nice driver quality car that certainly looks the part. The cream of the crop…..!! 1965 Ford Mustang GT Fastback. Yes, a true factory Mustang GT fastback..! It is powered by a correct A code 289 4V Windsor V8 with factory cast iron intake and correct 4100 Auto-lite carburettor all coupled to a C4 automatic and standard rear end. All correct GT options including Kelsey Hayes GT disc brakes, heavy duty front suspension, trumpet style GT exhaust, GT fog lamps and GT emblems and side stripes. Factory upgrades include pony deluxe interior, pony woodgrain steering wheel, woodgrain appointments, centre console, fold down rear seat, deluxe seat belts, visibility group (mirrors) and style steel wheels with white wall tyres. The Rangoon red paintwork is in excellent condition and interior is immaculate. It has a beautifully detailed engine bay and trunk areas. It runs and drives beautifully and would present extremely well at any car show. These don’t come around too often, so be quick to secure this amazing GT fastback. 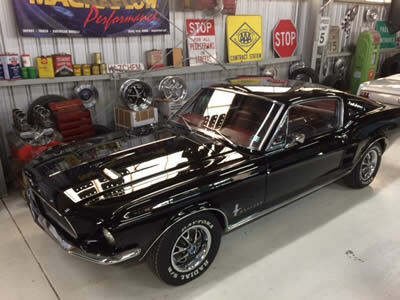 Here we have a gorgeous 1966 Ford Mustang Coupe in Raven Black. This California built Mustang coupe is an absolute standout in Raven Black with a black Pony deluxe interior. It sports a very health 289 2V Windsor V8 and 4 speed manual transmission. Other options include power steering, air conditioning, GT fog lights, pony interior, pony woodgrain steering wheel, woodgrain appointments, Pony floor mats and style steel wheels with white wall tyres. The Raven black exterior is in excellent condition the Pony interior immaculate and it has a beautifully and correctly detailed engine bay and trunk area. It runs and drives beautifully and is an absolute standout on the road. Price includes current VIC roadworthy certificate. Great ocean road here we come….!!! Be quick to secure this amazing Pony. Looking to stand out in amongst the Mustang crowd – well this is the Mustang for you…! 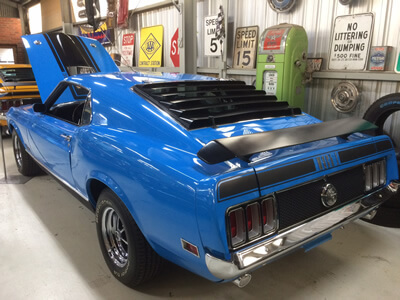 1970 Ford Mustang Sportsroof – restored Restomod. 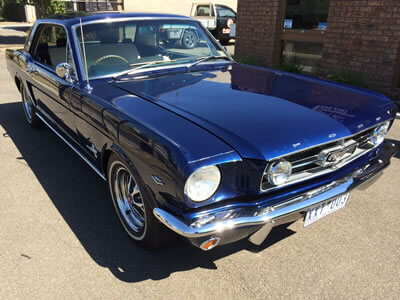 This classy looking fastback has undergone an extensive cosmetic and mechanical restoration including driveline rebuild, new high quality paint job, interior refurbishment and all chrome work redone. It is an absolute standout in Raven black with a classic black standard interior. The rebuilt 302 4V Windsor runs strong with great power delivered from a 4 barrel carburetor and Weiand intake manifold. It also sports power disc brakes, power steering, headers, heavy duty aluminium radiator and 18″ Billet Magnum 500 wheels with brand new sports tyres. Great opportunity to get yourself into a Mustang fastback without breaking the bank…! Here we have a very original survivor 1970 Mustang Sportsroof fastback. Purchased from the original owner in Pasadena with just over 92,000 original miles…!! California built and owned from new this fastback is all original with the exception of a repaint back in 1995. According to the Marti Report on hand it was originally Lime Metallic. It is pretty much stock as a rock with the only factory options being: Power disc brakes, power steering and sport deck rear seat. Original survivor cars are rare and hard to find these days so don’t miss this opportunity. 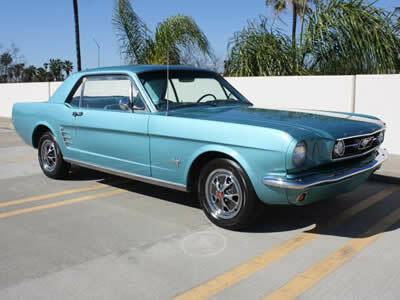 Up for grabs here we have this gorgeous 1965 Ford Mustang fastback. Finished in Rangoon red with red and white Pony interior this surely must be the most outstanding early Mustang colour combination. It sports a peppy and smooth running 289 Windsor V8 engine with Ford correct 4V intake, Auto-lite 4100 carburetor and upgraded Pertronix ignition system – all coupled to a C4 automatic and limited slip 2.80 ratio rear end. Other mechanical options include power steering and Kelsey Hayes GT power disc brakes. It has a long list of Ford factory options, including the following: Air conditioning, GT badges, GT side stripes, GT dual trumpet exhaust, GT fog lamps, remote style mirrors, lighted grille pony, Super Rare hood pony, Style steel wheels with white wall tyres, remote boot release, fold down rear seat, Pony deluxe interior, Pony woodgrain steering wheel, woodgrain interior appointments, centre console, rally pac, original AM radio, aftermarket 8 track, Super Rare quarter trim speaker grilles and Pony floor mats. Excellent chrome, perfect glass, really nice paintwork with just a few minor chips and scratches and a gorgeous interior. All in all an amazing fastback that sounds great, runs & drives beautifully and looks a million dollars. Be quick to secure this rare classic. 1969 Mustang Mach1’s are quickly proving themselves to be one of the most collectable muscle cars in the market place. Don’t miss out on this opportunity to secure a true investment quality car at an affordable price. 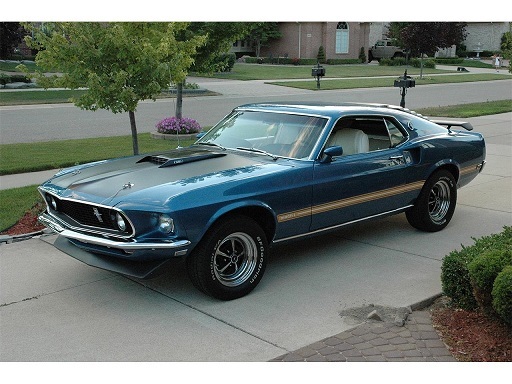 This Mach1 is not only rare but just as importantly, is in exceptional condition. The Acapulco blue paint is amazing with just a couple of minor chips that have been touched up. The white deluxe interior is in excellent condition and quite a standout. Sporting a very healthy M code 351 Windsor 4V V8 engine and 4 speed manual transmission it sounds and drives exceptionally well with plenty of get up and go. Other options and appointments include: Power steering, air conditioning, power disc brakes, deluxe interior, rim blow steering wheel, centre console, wood grain appointments, front & rear spoilers, rear window louvre, pop open gas cap, blackout hood treatment and Magnum 500 wheels with BF Goodrich raised white letter tyres. The under body floors and frame are detailed in red oxide finish and engine bay & trunk area correctly detailed. All in all, an exception car and sure to appreciate in value year in year out. Victorian roadworthy certificate included in the selling price. Here we have a one owner, California built & owned 1964 Falcon Sprint – super rare with Just over 88,000 original miles. This Sprint retains the majority of its original Silver Smoke grey paintwork and has the expected amount of chips, marks and flaws as you would expect from 50+ year old paint. The black interior has the bucket seat arrangement and includes the correct factory tachometer and faux wood steering wheel. It sports the original factory 260 Windsor V8 engine coupled to a Ford-O-Matic 2 speed auto and power steering. The wheels are the original 13” steel with correct wire hubcaps. Overall it’s pretty much as original as they come – right down the the California registration still attached to the steering column…! A super rare Falcon Sprint that needs some father / son TLC & love. With the rising prices of Aussie Xm & Xp coupes, get yourself into a rarer factory V8 Sprint and stand out from the bunch. Wow, what can we say here…. Perfection & show quality with just over 52,000 original miles. This fully restored Futura hardtop in Wimbledon White with deluxe red interior must be seen to be believed. Sporting the peppy & economical rebuilt 170 Cu In 6 cylinder engine, coupled to a 2 speed automatic this Futura is an absolute pleasure to drive. The exterior paintwork is flawless & is perfectly complemented by the red deluxe interior which is perfect and beautiful. The chrome & stainless is all immaculate and the glass is all perfect. It has a fully detailed engine bay, trunk area and red oxide under body with rebuilt brakes, suspension & new exhaust system. The wheels are the original 13” steel with correct wire hubcaps. Roadworthy certificate included in price. Overall this Falcon is show ready – inspection will not disappoint. 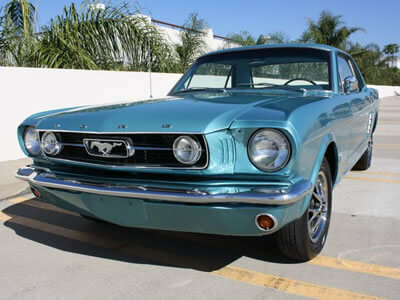 Up for grabs here we have an original unrestored 1965 Mustang GT coupe with just over 72,000 original miles. San Jose, California built, it still retains its original Caspian blue paint and blue & white pony interior. It sports the original factory 289 V8 Windsor engine coupled to a C4 automatic transmission. The carburetor and intake have been replaced with a more economical 2V setup (autolite 2100 carburetor) and a chrome air cleaner. Other factory options include: Power Steering, Kelsey Hayes GT disc brakes, GT suspension, GT fog lamps, GT gas cap and GT dual trumpet exhaust. Yes, it needs TLC but a great base for a father son project. Best of all it’s a genuine original factory GT. Here we have one extremely rare 1967 Ford Mustang GTA 390 coupe. Marti report & Ford USA verified, we believe this to be the only one of its kind built considering its long list of factory options. Clearwater aqua exterior with aqua deluxe interior. GT equipment group. San Jose, California built & owned since new. S code 390 FE big block V8 engine, C6 automatic transmission, power steering and power disc brakes. GT options include dual GT exhaust system, GT pop open gas cap, GT side stripes & badging, GT fog lamps, heavy duty GT suspension and power assisted 4 piston GT disc brakes. Cosmetic factory options include Interior décor group (deluxe interior), roof console, lower centre console, exterior décor group, upgraded Mustang audio unit, rocker panel mouldings, turn signal hood, deluxe wood Sebring steering wheel, tinted glass and style steel wheels with raised white letter tyres. It runs & drives like a dream with loads of power as you would expect from a 390 V8. Overall, an exceptional GTA coupe. Rare opportunity to own a true investment grade collector car. Here we have a true muscle car for someone needing to stand out in the crowd. Nicely built 302 4V Windsor engine, 4V alloy intake, Holley carburettor, electronic ignition & shaker, heavy duty radiator, dual GT exhaust system with GT tips & rear valance, export brace, heavy duty suspension, 5 Speed Tremec transmission with Hurst shifter, power steering, power disc brakes, shaker system & shaker hood with twist locks, hood stripes, correct twister decals, sports mirrors, front spoiler, rear spoiler, rear slat louvre, sports lamps, wheel arch moulds, tinted glass, pop open gas cap, magnum 500 wheels with BF Goodrich radial TA tyres, deluxe interior, sport deck fold down rear seat, Sebring woodgrain steering wheel, centre console & AM / FM radio with amp & quality speakers. Wow, quite a mouthful…!! Californian built in April 1970 it is 100% rust free & pretty much immaculate everywhere. Don’t miss this opportunity to secure a tastefully restored Mach1 that drives like a dream, sounds awesome and is ready to show. Wow, what can we say here…. Perfection. This fully restored Futura hardtop in Raven black with deluxe red interior must be seen to be believed. Sporting the peppy & economical rebuilt 200 6 cylinder engine, coupled to a 4 speed floor shift this Futura is an absolute pleasure to drive. The Raven black paintwork is flawless & is perfectly complemented by the red deluxe interior which is beautiful. The chrome & stainless is all immaculate and the glass is all perfect. It has a fully detailed engine bay, trunk area and underbody with rebuilt brakes, suspension & new exhaust system. The wheels are the original 13” steel with correct wire hubcaps. Up for grabs we have a nicely optioned & Marti Report verified 1972 Mach1 Sportsroof in Ivy Glow metallic (dark green) with silver accents and stripes. It sports a standard 351 Cleveland V8 engine and automatic transmission. Other options include power steering, Air conditioning, front & rear spoilers, sports mirrors, Ram air hood, pop open gas cap, hump hugger console, Wood grain steering wheel, CD player and Magnum 500 wheels with BF Goodrich radial TA tyres. The exterior paint work is about 15 years old and is still in overall good driver quality. The interior has been refurbished and in excellent condition. Overall a nice tidy Mach1 Mustang ready to cruise and show. 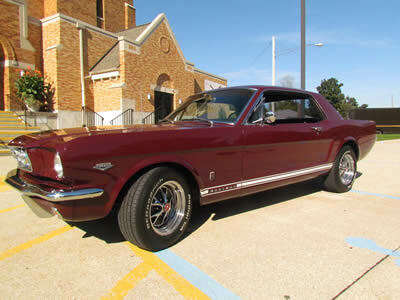 Up for grabs here we have a super nice nut and bolt restored 1966 Mustang GT coupe. Finished in its original factory colour of Candy Apple red and sporting the red interior this GT is truly a standout. California built it spent most of its life in and around Los Angeles before heading to Colorado later in its life. It was restored some 5 years ago and still looks perfect. The paintwork is excellent, interior immaculate, chrome & stainless all perfect and it has a show quality engine bay, detailed trunk area and red oxide underbody & floors. It sports a strong 289 4V V8 Windsor engine with Edelbrock carburettor, chrome air cleaner and heavy duty alloy radiator all coupled to a C4 automatic transmission. Other options include: Power Steering, Air Conditioning (R134A), Kelsey Hayes disc brakes, hump hugger centre console, deluxe seat belts, factory AM radio, GT fog lamps, GT gas cap, GT dual trumpet exhaust, style steel wheels and BF Goodrich radial TA tyres. Overall a gorgeous car sure to impress…Best of all it’s a genuine original factory GT. Here we go…. Marti Report verified Grabber Blue Mach1 4 speed shaker car. This Mach1 is a true collector muscle car and will surely appreciate in value for many years to come – Here is a brief description of its appointments and options: Grabber blue paint work, shaker hood, black-out hood treatment, front & rear spoiler, rear louvre, pop open gas cap, front sports lamps, sports mirrors, deluxe Mach1 interior trim with rim blow steering wheel, 4 speed Hurst shifter, AM/FM radio, fixed rear seat, Magnum 500 wheels & BF Goodrich radial TA tyres. The driveline is a 351 Cleveland V8 with 4 barrel intake & Holley carburettor, shaker system, 4 speed close ration toploader transmission with Hurst shifter, 3.25 ratio heavy duty rear end, power disc brakes & power steering. Overall a standout Mach1 and a very rare car. 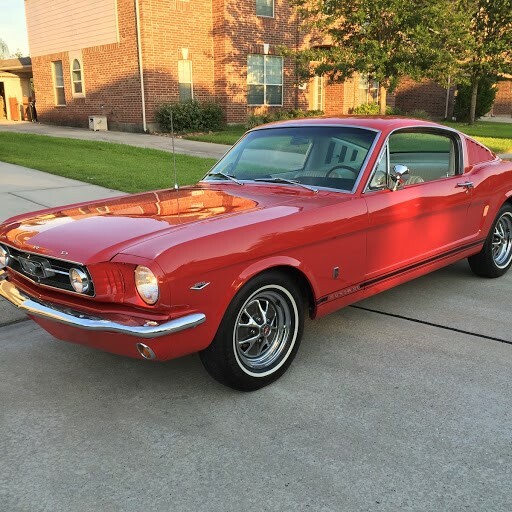 Here is the car that everybody wants – A red on black 1965 Ford Mustang Fastback…! Sporting A built 289 4V V8 engine and 4 speed transmission this fastback is for the true driving enthusiast. The driveline has been rebuilt throughout – performance built 289 with Edelbrock intake, Holley carburettor, ceramic coated headers and 2 ½ dual Flowmaster exhaust system. Transmission is a super T-10 4 speed coupled to a posit trac 3.25 ratio rear end and heavy duty suspension. It has factory Kelsey Hayes disc brakes with a power booster fitted and power steering. The engine bay is nicely detailed with Cobra valve covers, oval air cleaner and a nice amount of chrome. The exterior paintwork is about 20 years old and would be best described as driver quality but still shines nicely & looks the part. The interior has been refurbished with Pony seat upholstery & door trims plus a rally pac, centre console and fold down rear seat. It also has a hidden stereo system in the glove box. Other options include style steel wheels with BF Goodrich radial TA tyres, GT fog lamps, GT style trumpet exhaust. California built back in 1965 it has perfect underbody & floors with absolutely zero rust. 1967 Mercury Cougar Big Block – Dan Gurney Special. 390 GT 4V, automatic. Turquoise with aqua trim & loads of options. Unrestored survivor car & very rare. Here is one for the restorers & collectors out there, an unrestored & Damaged red on red 1965 Mustang GT Fastback. This two owner California built and raised GT Fastback still retains the majority of its original paint from 1965. The 70+ year old last owner was driving the car regularly right up until the accident which took it off the road 12 months ago – at which time his family finally convinced him to hand his license in. It is currently running an 80’s 5.0 Windsor V8 and automatic transmission. Obviously it is not running or driveable at present. Aside from the damage to the left front area, the rest of the body is in excellent condition – the underbody & floors are amazing, still showing the factory applied red oxide coating throughout. The red standard interior is presentable with no modifications to the dash / radio area and no speaker holes cut anywhere. Project Fastbacks are very hard to find now – GT fastback projects are nearing on impossible to find…!! Correctly restored 1965 GT Fastbacks are now bringing upwards of 100k, so don’t miss this opportunity to cash in on the future potential of the Mustang. Quality fastbacks are becoming harder and harder to find – especially clear standouts like this one. Built C4 Automatic transmission, 3.55 Posi Trac rear end, Borgeson power steering, Power disc brakes – SSBC, Flowmaster exhaust system, Export brace, Heavy duty radiator, Rebuilt suspension with KYB shock absorbers. Deluxe GT style bonnet with flutes & turn signals, Pop open gas cap, Style steel wheels with Daytona raised white letter tyres, Wheel arch mouldings, Rocker mouldings, Tilt adjustable steering column, Deluxe woodgrain steering wheel, Fold down rear seat option and deluxe seat belts. The engine bay & trunk areas are nicely detailed and it comes with a full file of receipts. How often do you see a 6 cylinder Mustang with all the deluxe upgrades? Well, this one is it! This gorgeous Mustang coupe has the following options, appointments & upgrades: Aqua & white Pony deluxe interior, upgraded audio system, hump hugger console, power door locks, remote opening, alarm system, GT fog lamps, GT dual trumpet exhaust & Pony deluxe hub caps and white wall tyres. The Tahoe turquoise exterior is in excellent condition and is perfectly complimented by the aqua and white pony interior – also in excellent condition. The trunk area is nicely detailed and it has super nice chrome and stainless all round. It sports a peppy 200 cu in 6 cylinder engine (with many upgrades), C4 automatic transmission, power boosted front disc brakes and a dual exhaust system which makes it sound just like a V8….! You will be the envy of all your friends and have fewer trips to the fuel station too…! 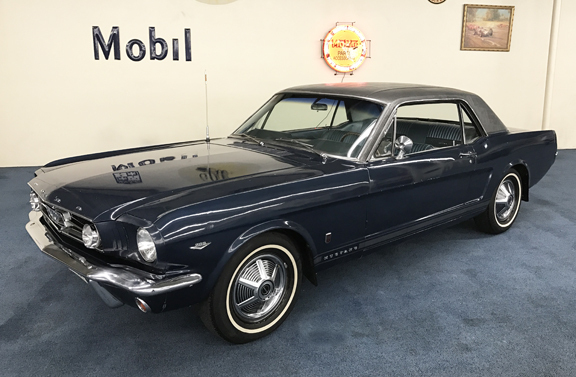 Here we have up for grabs a nicely restored, California built 1965 Mustang coupe finished in Caspian / Galaxie blue with white & blue interior which has been fully and correctly converted to right hand drive. It sports a smooth running 302 Windsor V8 with Edelbrock 4V intake, Holley 4 barrel carburettor, headers, electronic ignition, heavy duty radiator & thermo fan all coupled to a C4 automatic In addition it has power steering and power boosted brakes. It runs and drives like a dream with plenty of power and a great exhaust note to ensure it sounds like a Mustang should. Other options include Pony deluxe wood grain steering wheel, upgraded CD stereo, dual mirrors, 3 point front seat belts, GT fog lamps, GT trumpet style twin exhaust and style steel wheels with white wall tyres. The chrome & bright work is all in excellent condition as is all of the glass. The engine bay & trunk area are both nicely detailed. 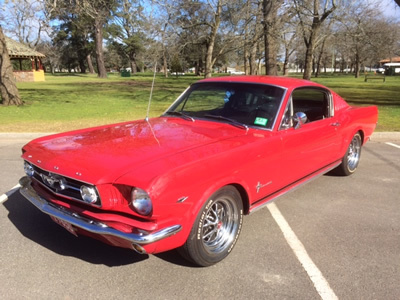 All in all a gorgeous Mustang ready for cruising the Australian highways. Well, GT convertibles don’t come up for sale too often, let alone fully converted right hand drive ones..!! This nicely restored GT convertible is presented in clearly one of the most standout colour combinations – Tahoe turquoise with aqua & white pony interior. It has undergone an extensive restoration, including a mirror right hand drive conversion to high standards. It sports a smooth running 302 Windsor V8, C4 automatic, power steering, power boosted disc brakes, power convertible top, GT fog lamps, GT dual exhaust with trumpets, GT gas cap, GT badges & striping, deluxe Pony wood steering wheel & woodgrain appointments and style steel wheels with white wall tyres. All of the chrome & bright work is in excellent condition plus it has a nicely detailed engine bay & trunk area. Fully engineered & complied, it is ready to enjoy now. It runs and drives like a dream and will see you the envy of all your friends – be quick this won’t last long. 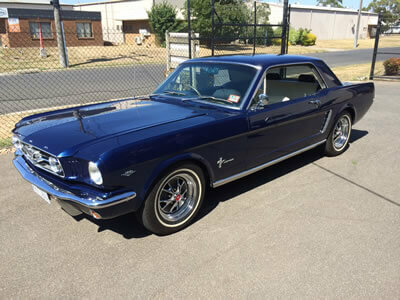 Trying to find a Mustang for sale in Australia? Looking to buy a restored GT500 Eleanor? Realise your dream of owning an original muscle car with Griffs. Picking up a classic muscle car is no light decision. You need to know what you’re doing, and you need to know that the vehicle you are looking to buy is right for you. Whether you are looking to recapture a bit of nostalgia, want something that will stick out from the hordes of modern cars, or are looking for an investment item – we have the right classic vehicle to suit your requirements. We have a huge range of Australian based muscle cars for sale. Manufactured all over the world (with many imported from the USA), we have all the premium brands including Ford, Mercury, Chevrolet and more. These vehicles represent the pinnacle of classic engineering and have been beautifully maintained and restored, ensuring they are in top working order. As a specialist vintage, classic & muscle car workshop, we know exactly what these unique vehicles require. From the paintwork to the motor and even specialist tyres, we pay great attention to detail. This ensures you get a great vehicle that with the proper care and attention will last for many more decades to come. Take a look at our current range of classic muscle cars for sale in Australia below. We have new models arriving all the time, so be sure to check back often. If you are looking for a particular model, just ask – we may be able to source it for you!